Ferry to Hong Kong (Rank Organisation,1959) US Half Sheet 22"x28"
Starring Curt Jurgens and Orson Welles. Mark Conrad, a habitual drunk and troublemaker with a shady past, is expelled by Hong Kong police after one too many bar fights. He's sent to Macao on the Fa Tsan, a ferry owned by Captain Hart. Conrad's papers are out of order and Macao refuses him entry. 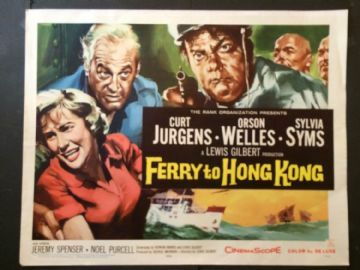 Unable to go ashore, Conrad is a permanent passenger on the ferry with Hart, who detests him.The poster has never been folded. and has one crease on the bottom right corner. Displays very well. Grade: (C8.5) Very Fine .